I've lost count of how many times I've sat down to write this reflection. I knew it had to be about Dr. King, yet I am left speechless. Ironic, I know. Dr. King was anything but speechless. He cut through the noise with such clarity, such vision, such courage. And though he spoke to millions, he always spoke directly to me. Even at the tender age of 7, I could feel the power of his words, see the richness of his vision, and I longed to have the courage of my convictions. In so many ways, I have failed. Clarity has eluded me. My vision has been muddy. And I have shrunk back when I could have stepped forward. 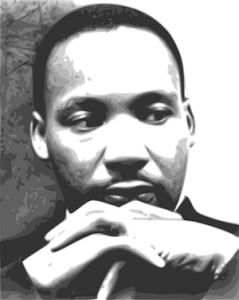 I so wanted to live in a way that would have earned Dr. King's respect, perhaps a hand on my shoulder or an approving nod. I still feel that shame inside... until. Until I remember that he spoke of our humanness, our imperfection - then lifted us up. I've failed in so many ways, except one. I continue to reach for that mountaintop - not alone, but shoulder-to-shoulder with all the other messy, imperfect humans striving for freedom - and I dream of lifting others up along the way. Lifting each other up. It's all that really matters, isn't it? The rest is just noise.